This past Saturday, neighbors and passersby may have had the treat of seeing a flailing, sobbing, hyperventilating me, shouting to Brandon in our driveway. "Hurry! Take the girls! How did this happen! I'm going to throw up! I'm seriously gagging! I can't believe this happened! How did this happen! Today was the basketball game and WE WERE IN CHARGE OF SNAAAAAAAAACK TIMMMMMME!" Imagine also, that the latter half of that public word vomit came out in the voice of Chewbacca. I really wish I was exaggerating to make this funny. It was great timing too, as Brandon and I were just this week discussing how we want to be more neighborly and invite our next-door-neighbors over for dinner. "Dinner? Oh...how kind of you...do you mind if I bring a bodyguard? Or would it be okay if during the dinner, you were under the supervision of an experienced mental health professional?" How I forgot that Ever had a basketball game and that I was in charge of snacks is a mystery to me. Of course, I could make a long list of all the life obligations swirling around in my brain right now, but we all have responsibilities and burdens in our swirlers. I use iCalendar! I woke up knowing there was a game that day! I just forgot. 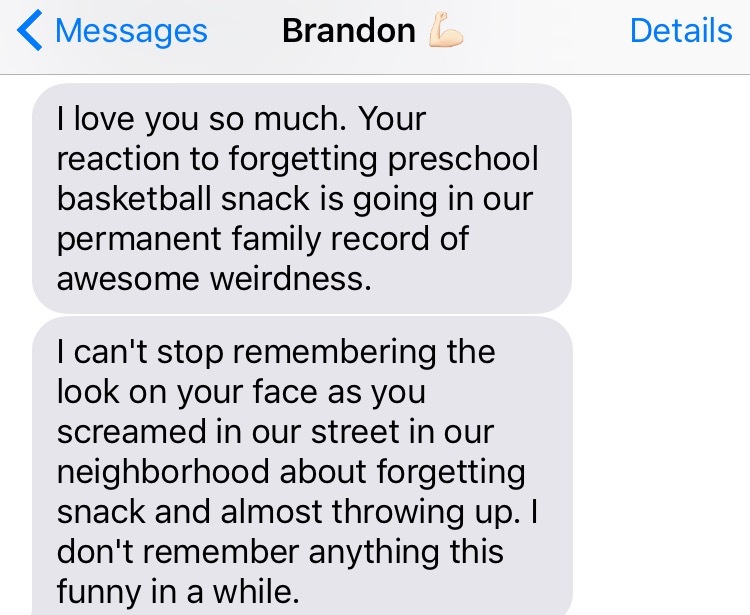 The question is, how did I get to the point where I was so overcome with basketball-snack-mom anguish that I forgot I live in a house which sits in a neighborhood full of other humans who might not want to hear a crazy lady sobbing and shouting in the driveway about preschool sports in the middle of the day. So, leading up to this...event...it had already been a day. By that I mean, unimportant, frustrating life stuff had already happened. I got myself and both girls into people costumes (you know, real pants, cleanish shirts, etc.) and ready to go the gym so that they could be babysat and I could get deadlines knocked out for my part-time job. But, by the time I got the girls out the door and to the entrance of our subdivision, I realized the childcare was about to close, so I turned around and drove back home. I had really wanted the gym childcare employees to get to spend some time with my girls, so I went home disappointed and distracted. It was 12:30. The game started at 1:30. At 1:59, I Chewbacca-ed for the neighbors, left the girls with Brandon, picked up snacks, and sped to the gym. I arrived as the coach and his son were leaving. So, I gave them a snack, got back into my car, called my sister, and sobbed. Just telling my sister the whole ordeal out loud felt so ridiculous. She was so calm about the whole thing. "You forgot snacks for a team of 5-year-olds who don't really know where they are or what they're doing. It's gonna be okay." But my inner monologue was more like: Your child feels unloved. She will always remember this. The parents and coaches think you're a flake. Your neighbors now think (know) you're insane. You are a failure at everything. And did I mention that your child will now and forever feel unloved? As true as that felt in the moment, I had to ask myself what Jesus would say. Jesus didn't die so I would worry so much about myself! He didn't rescue me so I could ride the high of "my" successes like I'm a superhuman and wallow in despair when I fail. He isn’t “transforming me into His likeness with ever increasing glory” so I can claim the "peace that surpasses all understanding" for my major life pains but then fall apart at basketball snack time. He lived a perfect human life and took on all the punishment and suffering I am owed for my past, present and future failures. Because of that, I can live with freedom. Freedom to love my neighbors (even though they may have witnessed my burst of insanity). Freedom to admit when I make mistakes and move on from them in grace. Freedom to shrug it off when one of my spinning plates shatters. Because of Jesus, my forgetfulness is forgiven. My meltdowns are forgiven. My biggest, baddest past sins are forgiven. And my future sins, many of which will likely be much worse than The Chewbacca Snack Incident, are already taken care of. So what if my meltdown makes it's way into my five-year-old’s reel of first memories? She is 100% going to know that she was raised by an imperfect mom. I just pray that when she looks back and remembers these moments, she remembers a lady who loved her and who got up off the floor when she fell, remembering she’s a child of God. I don’t have to be devastated by public opinion or by my own opinion of myself if I’m living for the only opinion that really matters. No amount of snack forgetfulness or driveway despair can change how God feels about me. Also, Lord, please grant my children, neighbors, and fellow basketball snack moms the gift of grace and a sense of humor.